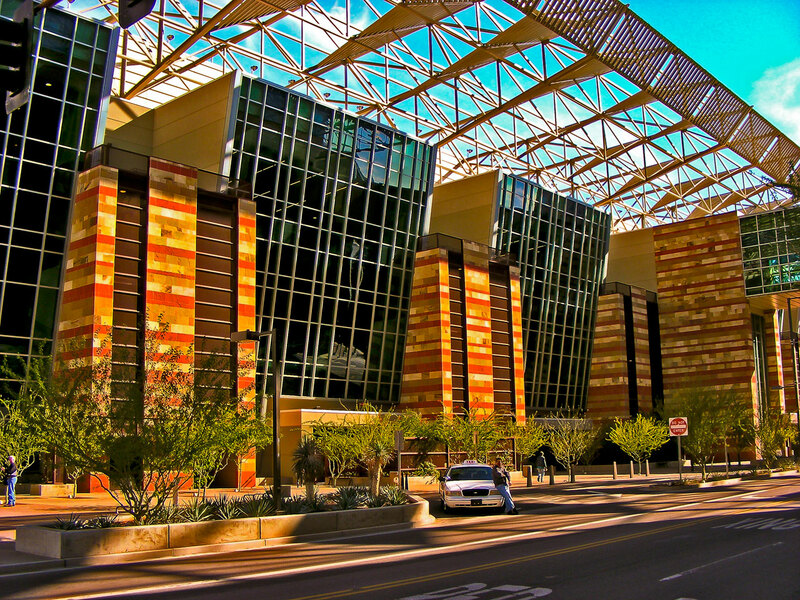 The Phoenix Convention center located in Phoenix, AZ is a beautiful modern building with 900,000 sq ft of space dedicated to exhibition and meeting and conference space. The Convention Center hosts Arizona’s largest ballroom, a 46,000 sq ft, two entrance space with high ceilings and a dedicated street entrance. You’ll find a large selection of restaurants within walking distance of the convention center. If you find yourself in need of a great, affordable meal, check out a few of these fantastic restaurants. Reasonably priced American cuisine with a casual vibe and large menu. Make sure to try their artichoke hummus appetizer and raw bar featuring oysters, shrimp, mussels and king crab legs. If you’re looking for a restaurant with breakfast, lunch and dinner selection outside the convention center, District American Kitchen Wine Bar comes highly recommended. They have a sizable breakfast menu featuring many classic breakfast items such as corn beef hash and scrambled eggs. Their breakfast menu is on the pricy side but their portions are hearty and nothing on their lunch menu is over $9.00 past 12noon. You may be familiar with the timeless look and feel of the Hard Rock Cafe. If you’re looking for a full bar and live music or other popular events, you can’t go wrong with the Hard Rock.You’ll find reasonably priced American cuisine. If you need a recommendation, try one of their delicious Angus beef burgers. A contemporary American gastro lounge. Blue Hound is well known for it’s hand crafted cocktails and sustainable local ingredients. Awarded the winner 2014 OpenTable Diner’s top 100 most scenic restaurants in the US, and for good reason! Compass has an incredible view so book your reservations early for the only rotating rooftop restaurant in Phoenix. You can get a full, 360 degree view of the city. Their menu has some timeless classic entrees re-imagined for modern cuisine such as shrimp and grits. Affordable cuisine with a large bar and great drink specials. Serving brunch, lunch and dinner, 1130 has an incredible menu selection full of favorite items such as steak and eggs Benedict and breakfast burrito (brunch menu), Reuben and french dip sandwiches (lunch menu) and table side guacamole and BBQ pork spare ribs (dinner menu). No trip to the southwest can be complete without authentic Mexican cuisine. Mi Amigo’s features food from many Mexican regions. They have a lengthy menu filled with many familiar southwestern foods, drinks, and desserts. Our favorite is their Chicken Chimichanga. Craving American Chinese? Panda Express is right around the block from the Phoenix Convention Center. Pandra express features a very reasonably priced menu and delicious combination platters. The food is fast and filling.